When I saw Fiona demonstrating to cook her invention recipe of Chocolate Ganache, Lavender Cream and Raspberry Tart on MasterChef, I said to myself that, I had to make this beautiful tart. Unfortunately, the unsprayed lavender was hard to find. Yet, big and beautiful strawberries were everywhere. 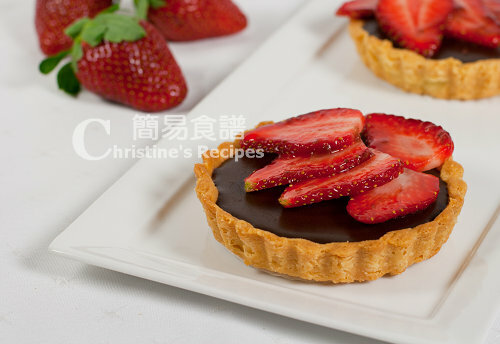 So, I adapted Fiona’s recipe to make the tart shells and chocolate ganache, topped with jelly-coated sweet strawberries. It turned out to be a big hit in our family’s dinner last weekend. 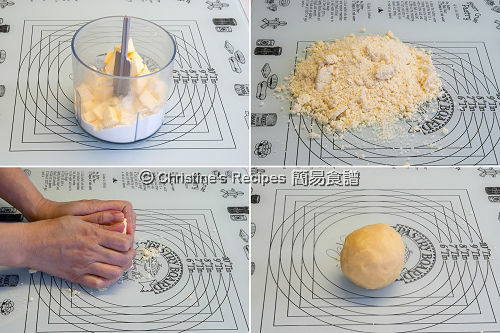 Place the flour, butter and a pinch of salt in a food processor and blend until the mixture resembles fine breadcrumbs. Add 1-2 teaspoons cold water and blend again until the dough just comes together. Tip out onto a lightly floured board or clean bench and form dough into a disc, enclose in cling film and refrigerate for 15 to 25 minutes. 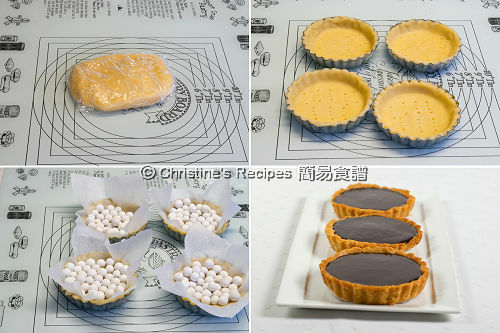 Roll pastry out to 3-5mm thick, then use to line four 10cm loose-bottomed tart tins. Prick the base with a fork, then place back in the fridge to rest for about 15 minutes. To make the ganache: place the cream and butter in a heatproof bowl over simmering warm water, heat until butter has melted. Add chocolate and sugar into the mixture, then stir until the chocolate has melted. Remove from heat. Preheat the oven to 180°C. Line the pastry case with baking paper and pastry beads or uncooked rice. Blind-bake for 8-10 minutes, then remove baking paper and beads and bake for another 5-10 minutes until golden. Press down any bubbles that have risen up and allow to cool. Remove from tart tins and place on a serving plate. Heat jelly with water until completely dissolved. Transfer the chocolate ganache into the tart shells. Spread evenly with the back of a spoon or palette knife. Arrange the strawberry slices on top and brush with jelly on top of the strawberries. Serve immediately. 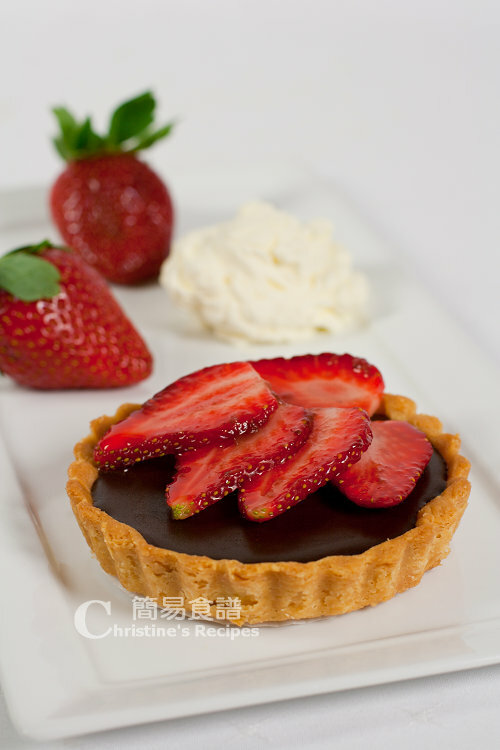 Love this chocolate tarts. I must bookmark it. Oh beautiful! I have lavender in my garden... will attempt. and that is a lovely tart indeed! This looks so delicious!! Perfect for a dinner party too. I found some dried lavendar in some nifty shops, not food shops, yet not sure if they are edible or not. Is there anyway you can make it the same without a food processor? will the texture/outcome be the same? Kneading the pastry is not that hard without a food processor. You can do it just by hands with a similar result. which one would be recommended for the butter salted or unsalted? I often use unsalted butter. If you use salted butter, then you don't need to add salt yourself. Hi, I planned on making this recipe when I saw it on Masterchef ages ago as well, but I never got round to it. I'm now planning (again) to make it and came across your version - your ratio in the shortcrust pastry is a little different to hers; I was planning on halving it to 120g flour and 80g butter to end up with 2 10cm tarts, do you think that would end up being too dry and crumbly? Also... how on earth did you end up with 4 tarts from that amount of pastry?! The problems of cracking and shrinking are very common in making chiffon cakes. It's all about controlling the oven temperature if your batter is done properly. Besides, don't use non-stick or greased cake moulds. I absolutely love these tarts. Though I could not roll out the dough properly, may be because it was a bit dry, i used my fingers to press it on silicon cupcake moulds, again, I don't have tart tins. But it worked out really well. I also decreased the baking time since the moulds were not too big.